Have you ever heard of the food network show The Best Thing I Ever Ate? It showcases a bunch of celebrity chefs going berserk over their favourite foods. I had a moment like that last night. I sat there at the dinner table and could do nothing else but close my eyes and allow my taste buds the experience of a lifetime. I kid you not, folks – I think I just found the best thing I ever ate. And what a treat: I made the recipe! I get to make it again! I couldn’t have been more ecstatic! I’ve always been a huge fan of falafel. Those crispy little morsels showcase the best of Mediterranean food: garlic, parsley, onion, and chickpeas, all melded together to create a crispy patty. Slather them with Tzatziki, roll them into a soft pita and top them off with a little lettuce and tomato. Voila! A healthy Mediterranean street food dish that was surprisingly easy to make at home. 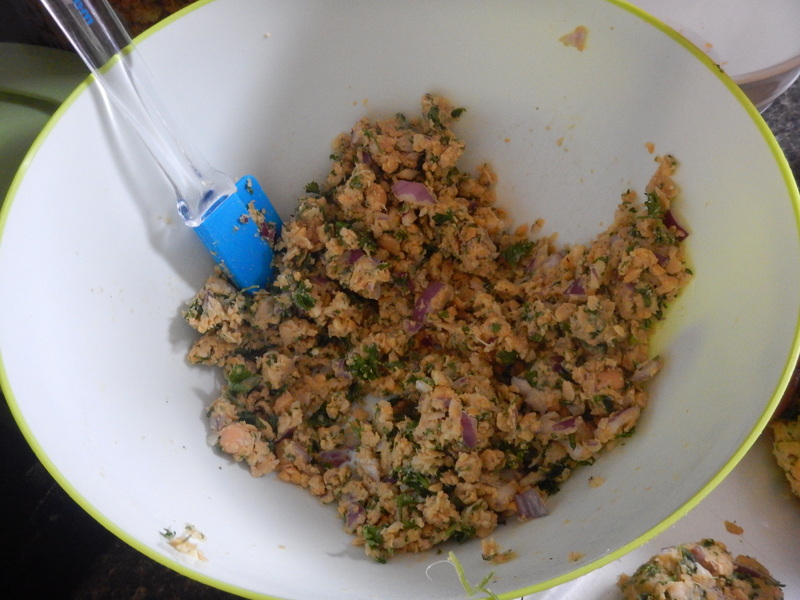 For this recipe, I found it easiest to pop everything into a bowl and coat the falafel base ingredients with the dry ingredients before transferring it all to the food processor. I processed the falafel in batches, because we have a teeny tiny adorable food processor (but its pink, so I don’t mind). 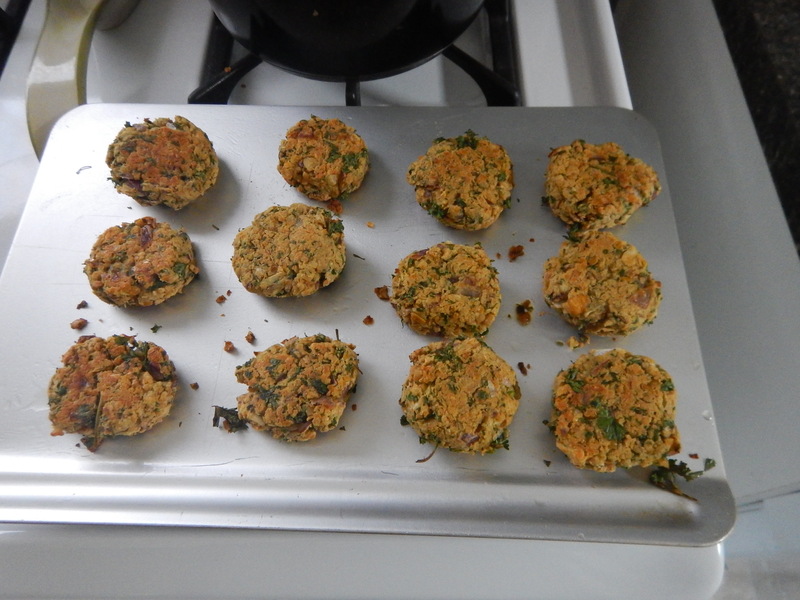 Once processed, it was time to make the falafel patties. Justin and I used an ice cream scoop to get the initial shape down, and them moulded them with our hands to create perfect little round disks. They turned out so cute and authentic looking. I brushed each side of the patties with Mighty Trio cold pressed canola oil, to get them crisp them up without having to pan fry. 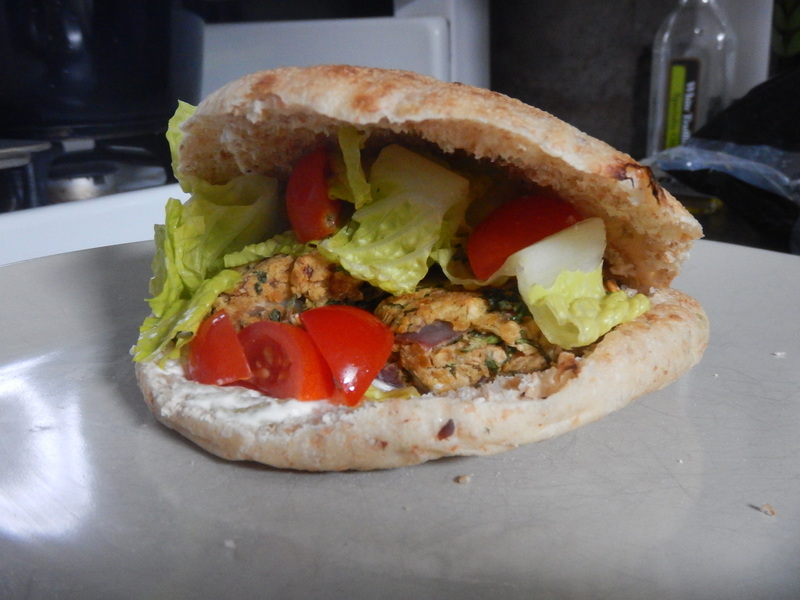 Top your pita with lettuce and tomato and enjoy possibly the best thing you ever ate! Preheat oven to 425. Combine all falafel base ingredients in a large bowl. Add the dry ingredients and toss evenly to coat. 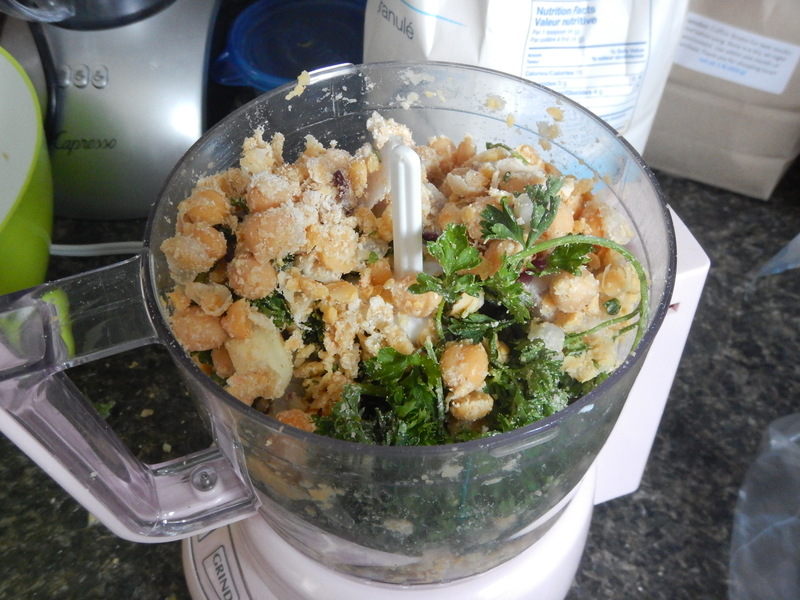 Transfer to a food processor (If yours is big enough – Huzzah! You only have to do this step once! ), and pulse the falafel until all ingredients are roughly chopped and incorporated (You are not looking for a smooth paste here – This isn’t hummus, it’s a tasty falafel, so keep a close eye on it as you process). Transfer back to the bowl and form your patties by using an ice cream scoop or a rounded spoon to form a ball, then use your hands to flatten them out and turn them into little disks. While most falafels are fried, these are baked. 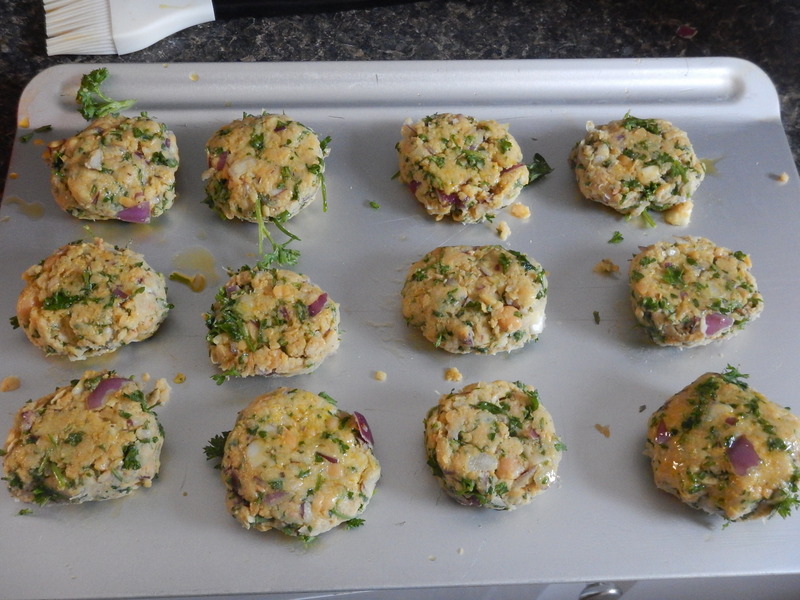 Brush each side of the falafel patties with canola oil and add to a baking dish. Bake at 425 for about 15 mins, remove from oven, and carefully flip each one. Bake for another 15 mins. While you’re waiting, assemble your pita. Cut open the pita, and slather with tzatziki. Fill with lettuce and tomato. When your falafels are ready, add two disks to the pita. Enjoy, oh so very much! I’m going to make this tonight! Which size of canned chick peas did you use?